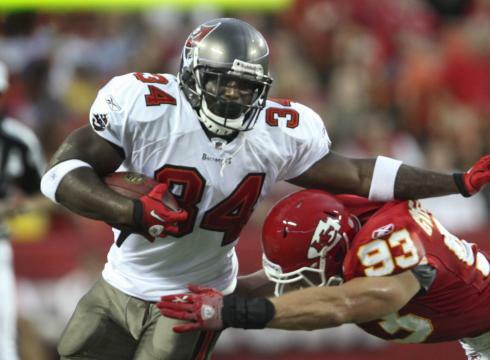 Graham a great fill-in for Buccaneers, but should he become starting RB? For National Football Authority, we discuss Earnest Graham’s star turn as a fill-in for LeGarrette Blount as the Buccaneers’ starting running back, and we consider whether Graham should take over the job full time. Click here to read who’s saying Graham should do so – and to find out what we think. At the suggestion of Carl, we’re going to take the opportunity to look at players whose touches should significantly rise or fall based on new circumstances this year. We’ll try to identify this trend among some players whom we have not yet discussed in our fantasy football coverage this year (which you can catch up on via this category on the blog or by searching via player name on the right). RB Fred Jackson, Bills – With Marshawn Lynch being suspended for the first three games of the season, Jackson will be a No. 1 back to begin the year. The fact that he was so productive as a No. 2 back last year (884 total yards, three TDs) makes him a solid fantasy backup; the fact that he’ll be the guy for three games makes him an early-season starter. Jackson is a No. 3 fantasy back in leagues of 10 or more teams, and don’t be shocked if he starts for your team at some point after Lynch’s three-game break. RB Darren McFadden, Raiders – This is more of a hunch than a situational call, but you can bank on McFadden having more than 142 touches in 2009. He missed three games last year and had three more games in which he had three or fewer touches. (Those numbers also indicate that someone else in Oakland, either Justin Fargas or Michael Bush, will likely lose some touches.) If McFadden just gets up to 10 touches in those games – which is a conservative projection – he becomes a borderline No. 2 fantasy running back. If he can move up to 15-20 touches a game, he’s a gimme starter with huge upside. RB Ray Rice, Ravens – Rice was the third guy in Baltimore’s RB trio last year, but all signs from training camp this year are that he has stepped up to be the primary running back. LeRon McClain will still get work as a fullback, but Rice should end up with more than 140 touches and more than 727 yards, which is what he ended up with last year. He’s a borderline starter and a flex option for fantasy leagues. RB Pierre Thomas, Saints – Thomas established himself as a big-time fantasy back last year despite being a part-time player in New Orleans. He had just 160 touches last year but turned that into 900 yards and 12 touchdowns. Now that Thomas has proven his ability to produce, we can count on him moving up into the 200 touch area, which will put him equivalent to or maybe even a tad above Reggie Bush’s load. That should push Thomas into the 1000-yard area, which will make him a borderline No. 2 fantasy back at worst. WR Donnie Avery, Rams – Avery was kind of under the radar as a fantasy wideout last year, but he had a strong season for a rookie, catching 53 balls for 674 yards and three scores (along with one rushing TD). With Torry Holt gone, Avery is now the unquestioned lead receiver for the Rams, and with some luck (most notably health for Marc Bulger) he could move up to the 70-catch level. As you project Avery, watch his leg injury, which held him out of most of training camp and could sideline him in the regular season’s first game or two. WR Patrick Crayton, Cowboys – As we discussed earlier, there are plenty of opportunities in the Dallas passing game. Crayton is the natural guy to move up from a 39-catch guy last year up into the 50-catch area. He was at that level in 2007, so he can do it. Crayton isn’t quite a fantasy starter, but he’s worth a bench spot as you see just how much of an opportunity he has in ’09. WR Jerricho Cotchery, Jets – With Laveranues Coles gone, Cotchery is the unquestioned No. 1 wideout for the Jets. While that’s not a huge fantasy production spot now that the Jets are going with rookie Mark Sanchez at quarterback instead of Brett Favre, Cotchery has a chance to up his reception total from 71. WR Anthony Gonzalez, Colts – With Marvin Harrison gone, Gonzalez moves up from a No. 3 slot receiver in Indy to a starting role. He’ll play both outside in 2-WR sets and in the slot in three-WR groupings, which means he’ll be on the field a lot. That means that he should see a bump up from his 57-catch total from last year. He’s probably not an 80-catch receiver, but 65 to 70 grabs is reasonable, and Gonzalez would likely turn that kind of opportunity into a 1,000-yard season. WR Domenik Hixon, Giants – Hixon, whom the Giants plucked off the waiver wire in 2007, emerged as a legitimate receiving threat last year with 43 catches for 596 yards and two scores in ’08. With Plaxico Burress gone, Hixon is the best down-field option Eli Manning has now. That’s worth knowing going into fantasy drafts. While his catch numbers probably won’t scream upwards – he’s more likely to end up in the 50s than in the 70s – he should make enough plays on deep balls to be an intriguing fantasy option most weeks. WR Eddie Royal, Broncos – Royal had a whopping 91 catches for 980 yards as a rookie, and it could be hard for him to match that catch level in the Broncos’ new offense. But we want to put him on this list to note that in the new Josh McDaniels system, Royal may end up with more catches than Brandon Marshall. And if Marshall holds out, sits out, or gets traded, Royal’s production will make him a starting receiver. This is a name you need to know going into your draft. WR Steve Smith, Giants – The Giants let go of Plaxico Burress and Amani Toomer in the last year, and so there are opportunities a-plenty in New York. Smith, who had 57 catches last year, is the most likely guy to lead the Giants in catches. He may not have the yards or touches that other receivers like Domenik Hixon or maybe even Mario Manningham create, but Smith will be the most consistent fantasy option among the Big Blue wide receivers. TE Marcedes Lewis, Jaguars – With the upheaval the Jaguars have experienced at wide receiver, there’s an opportunity for Lewis to step up his production this year. He had 41 catches for 489 yards last year, and he could move up toward 50 catches and 600 yards this year. Because of the depth of the tight end position, those are still backup numbers, but they make Lewis a legit backup, especially if your league forces you to carry two tight ends. PK Lawrence Tynes, Giants – After his postseason heroics in the Giants’ Super Bowl run, Tynes sat most of last season. He was hurt early, and replacement John Carney did so well that Tynes never really got a shot. But Carney is now in New Orleans, which means that Tynes once again will be the Giants’ full-time kicker. WR Lee Evans, Bills – Evans has been the Bills’ bellweather receiver for years now, but with Terrell Owens coming to town, he’s now more of a complementary player. That may not hurt Evans’ numbers too badly, because he’s averaged only 59 catches over the last two years. Evans will probably be around 55 catches this year, but with more of his chances coming downfield, he could average 16 or 17 yards per catch with six touchdowns or so. Still, that makes him more of a No. 3 receiver than the No. 2 he’s been in some recent years. WR Justin Gage, Titans – Gage was the Titans’ best receiving option last year, compiling 34 catches in the 12 games he played. Because the Titans’ offense isn’t that pass-happy, no Tennessee receiver is a great fantasy option. But the addition of free-agent Nate Washington indicates that Gage will be more of a possession receiver in ’09. That knocks him from being a fantasy backup to more of a waiver-wire option in most fantasy leagues. TE Benjamin Watson, Patriots – Watson, a former first-round pick, had a big fantasy season with 6 touchdowns in 2008, but he had just two last year. With Chris Baker coming on board, Watson should be even less of a receiving option this year. As a result, Watson is not a draftable fantasy guy. PK Matt Bryant, Buccaneers – Make sure you note on your list that Mike Nugent signed in Tampa Bay to take over Bryant’s job. PK Garrett Hartley, Saints – Hartley stablized the Saints’ kicking position late in the season last year, and the Saints’ kicker should be a high draft pick because of New Orleans’ prolific offense. But Hartley will miss the first four games of the season due to a league suspension, and the Saints brought in vet John Carney to fill in. Last year, Carney rode a fill-in spot with the Giants to a full season and a Pro Bowl berth. That means that you can’t bank on Hartley to begin the season and shouldn’t have him on your roster until Carney is out of the way.